I get requests for Lower fat/calories options, Vegetarian/Vegan options and I now have a request for lower sodium options and recipes. This article is not so much about a particular recipe, but more about options that can be applied to existing recipes ( mine or others) to help reduce sodium intake. I am not a doctor or a licensed nutritionist. Please do not use this information to over-ride any medical or nutritional advice provided to you by any professional. This is intended to offer ideas on how to cut back on the sodium but still keep flavor in your cooking. Please use these as suggestions (not absolute) and always read the labels of any canned or jarred items you may use, as they tend to be higher in sodium. Fresh or frozen is your best bet for quick vegetables. The good news is – there is a lot of flavor on this page. The even better news is, within a couple of days eating less salt and incorporating these substitutes, you will not miss the salt. At least I didn’t when I cut out salt a few years ago. That diet lasted about 3 months, as I was getting my MBA, single mother to a toddler and on call 24×7, I had to start eating take out again – darn pizza. But I did learn, your body adjusts fairly quickly. Note: Low fat or non-fat items typically contain 2 – 3 times as much sodium as the full fat versions. You can use full fat versions of items, like mayo, just use less. If you doctor it up with fresh herbs, horseradish, Dijon, garlic, a little goes a long way. Stock up on some of the below to make mouth-watering low-sodium cooking a breeze. I use low or no sodium broths on a regular basis when cooking. I do this so I can control the salt content of my dish. I do add salt, but in quantities for my own tastes, but you don’t have to. I always keep Low Sodium and Low Fat chicken, vegetable and beef broths in the pantry or freezer if I happen to make my own. Making your own broth is easy and you can control everything that goes into it: Here is my recipe for Chicken Stock. The same steps can be used for making beef or vegetable broth. For beef, you would use beef bones, roast them at 450 for about 20 – 30 minutes, then add them to the sautéed vegetables. For vegetable broth, you would just increase the amount of vegetables and even add extra vegetables such as asparagus, bell peppers, tomatoes (will end up with a reddish broth), leeks, scallions, broccoli, squash, etc.. whatever you have on hand and like. Fat is fat, the Calories are the same regardless if there is sodium or not. However, both of these are great ways to impart flavor with out the added salt. In fact, I never buy salted butter. I always cook with unsalted butter. Low Sodium dairy products (mayo, cheese) have their own versions, but using full fat items will get you lower sodium than using low or non-fat items. Dijon is my go to flavor enhancer. I use it in many dishes, sauces, salad dressings and dips second only to garlic. However, it is higher is sodium. You can make your own. I am working out a low sodium version of Dijon. My first batch ended up in the garbage. I put something baaad in. It is coming. But for now, there are other recipes on the web for making your own low sodium Dijon. Put all in a food processor and blend the heck out of it. You can substitute any of the peppers for your favorite peppers or what is available to you. You can add in fresh herbs as well – such as oregano, parsley, thyme, rosemary, basil, etc.. I typically keep them out as you never know what recipe you will use the hot sauce in. But to each his/her own preferences. The option is yours. Herbs, especially fresh, not only add a flavor explosion they are healthy as well. Growing herbs in a kitchen window is easy and makes incorporating them into your recipes every day very easy and convenient. No more buying a bunch of parsley only to use a TBS for a recipe. Just snip what you need. Or, buy the bunch, wash and blend with a little oil. I freeze in small ziplock bags and pull them out when I want to use them. Freezing with olive oil keeps them green and fresh and very easy to thaw and use on the spot to add a burst of flavor or color. In the summer I grow tomatoes, all kinds of peppers (hot and bell), eggplant, lettuce, beans in grow boxes on my deck. No need to have a large garden space to benefit from the summer growing cycle. And believe me, if I can grow a vegetable/herb garden anyone can. Ask all the house plants of Nicole’s past.. I have fake around the house now as I don’t seem to do well with actual live plants in the house. But my garden – thrives. And it is fun and inspires creativity and use of fresh ingredients. Mrs Dash and the like are combinations of herbs and spices without salt.There are so many varieties that make it quick and easy to add flavoring to anything. When you don’t have fresh, have a back up in your pantry such as these pre-mixed combinations. They are found in the spice section of the grocery store and makes cooking in a rush easy as you do not have to think about combinations, just pull out a bottle and sprinkle it on chicken, fish, pasta, etc..
You can grate your own and then fumigate your house, or just buy the jarred fresh grated horseradish Plain – NOT prepared horseradish. Sodium content is low in grated horseradish. Sodium is higher in the prepared horseradish jars. Horseradish is one of those items that can be added to mayo to kick it up a bit. 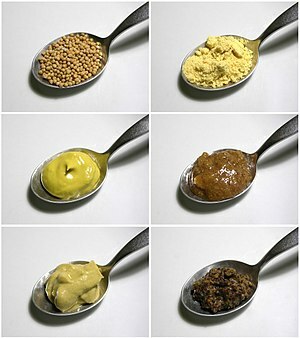 It is also a good substitute for mustard if you have not mastered making your own fresh low-non sodium version. Lemon Juice (acid) activates the same taste receptors as sodium ( source: http://www.hsph.harvard.edu/nutritionsource/salt/salt-substitutes/). Squeezing a little on your salad, in a sauce, on chicken, fish, pasta, etc.. it is a great way to add flavor and brighten your meal. I don’t know if this fits for any of you, but you can add some good flavor with a splash of wine, cognac, brandy, vodka, rum etc.. in your recipes when making sauces. You do not need much. For wine – gauge about 1/4 cup for a 12 in saute pan, and for the cognac, brandy, vodka, rum, figure about 1 TBS ought to do it for a 12 in saute pan for deglazing. You can increase the liquid volume by adding a low/no sodium broth. Fresh ground pepper adds a nice fresh flavor to foods. It beats pre-ground pepper any day. If you are cutting out sodium, get a pepper grinder and whole peppercorns and start grinding. Don’t have fresh herbs, but still need to make a great dinner? Use Pestos! or the fresh herbs you mixed with olive oil and froze. Here is link to my recipes and ideas for pestos, just omit the salt and parmesan cheese. The same can be applied to butters. Just use softened butter instead of oil in the recipes. I use roasted vegetables a lot to add flavors to dips, spreads, sauces, soups, dairy, condiments and/or just throw on top of fish when I am cooking it to impart a great rich Carmel flavor. Cut into a minimum of a 1/4 in thick slices and arrange on a baking sheet in a single layer. Drizzle the vegetables with olive oil, season with fresh ground pepper and your favorite dried herb (parsley, oregano, rosemary, basil, thyme). Bake at 375 for about 45 minutes, until the vegetable has shriveled in sized by about 1/2 and still has some liquid left. Remember, when you roast vegetables, they may shrink in size, but keep their original sodium content. Keep that in mind when calculating the total sodium in your dish. Roasted vegetables packed in a little olive oil can last in the fridge for a few days to be used for multiple dinners/meals. Another great way to infuse fresh flavors to dishes or as a side salad. I have a great salsa recipe, just don’t add the salt. Add a little more lemon or lime juice or vinegar. You can also make salsa without tomatoes. Why not use mango, papaya or even watermelon as the main ingredient? or use some tomatoes and some melon? There are no rules. Use what makes you happy. Salt substitutes are not a healthful option for everyone. Many salt substitutes contain potassium chloride in place of sodium chloride. Potassium consumed in excess may be harmful for some people. Always check with your doctor. You would think this is taboo as soy and teriyaki are loaded with sodium. There are low sodium versions of these sauces on the market. Granted they are still high, but a little can pack a punch when added to dishes. To increase the volume when using in a stir fry, you can dilute it using 1/2 soy and 1/2 water and a little sesame oil also helps to build flavors. Double the amount of sodium in the item being marinated. ie: if marinating chicken, 1 3 oz piece of chicken has about 60MG of sodium. If you marinate it in a liquid with salt, then calculate 120MG of sodium. of course the length of time you marinade will have an impact on how much is absorbed as well, but it is found that the protein will never exceed double the amount of sodium. This also makes it easy to calculate. One tablespoon of Vinegar has about 1mg of sodium. Skip the bottled dressings and start making homemade salad dressings. Use a high quality extra Virgin Olive oil (about 1/4 cup), your favorite vinegar (about 1 TBS), toss in some chopped garlic (1 tsp) and shallots (1tsp), fresh ground pepper (1/2 tsp) and a splash of low sodium Dijon mustard (1tsp). Simple but excellent. If you have fresh herbs, chop them up and toss them in. Put all in a glass jar with a lid, shake it up for a few seconds – What a delight! I hope these suggestions help in meeting your lower sodium needs. If you have more suggestions or links, please let me know and I will add them. Keep the suggestions coming! Posted by culinaryease on June 26, 2011 in General Cooking and tagged Cooking, diet, low salt, low sodium, no salt, PostaWeek2011, salt intake, salt substitutes, Special Diets.